Here it is! The final installment of the first copy of Puffin Post. The answers to the picture quiz will put some of you out of your misery – it wasn’t easy! Some of the titles have been out of print for some time! 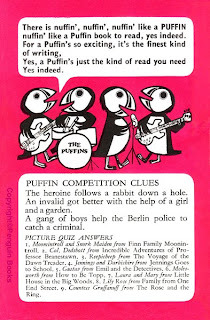 The cheery band of puffins are singing what was to become the first verse of the the Puffin Song, which has further verses and a score that was shared with early puffineers. If I can get round to it, I’ll post that as well. (It’s a bit cheesy, but very much of its time) If someone out there is musically minded, they might like to try and record it – or not. Coming up in the final Tuesdays before Christmas, I will post some seasonal covers and/or illustrations to cheer us up in these hard times! Once again, a big thank you to Ruth for sharing her archive with us – it’s been a joy to breathe new life into these little gems!